With trailers and press often giving away too much, since the first publishing of my movie writing started in 1997, I usually prefer avoiding any detailed media or specific info on a film in order to see it fresh, get drawn in, surprised, thrilled and awed by story elements. 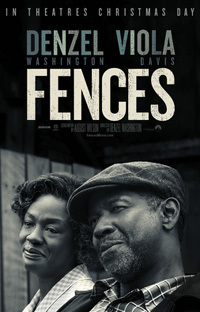 Within the first fifteen minutes of Fences I thought how much the dialog and setting feels like a play... And so it is. Based on the 1983 Pulitzer Prize winning play by August Wilson (and his own screenplay completed before his death), Fences is a deeply real, emotionally charged working class drama set in Pittsburgh in the 1950s. Troy Maxson is a sanitation worker (with ambitions to be promoted as driver), living with his wife Rose and their high school son Cory. His brother Gabriel (who got brain damage in the war) occasionally drops by with seemingly incoherent (but significant) ramblings, and Troy's first son Lyons (from a previous marriage) is an aspiring professional musician and usually swings by on Fridays when Troy gets paid. A promising baseball player in his earlier years, Troy's dreams of a pro career never came to fruition due to racial discrimination. Growing up hard, life is still a challenge. His wife is a good woman who accepts (most of) his flaws. They share dreams, aspirations, disappointments and deep wounds while living a modest life, but a shocking revelation is set to test the parameters of their relationship to the limit. There is conflict with Cory who wants to become a football player and Troy's authoritarian edict in his house is the age old one of: he pays the bills, so he makes the rules, and feels justified in putting those around him down, having paid his dues. One of the rigid tasks Cory has to fulfill each Saturday includes assisting in the building of a wooden fence around the back yard (where an alley connects all the houses on their block), a procrastinated job that seems like it may never be completed. While pleasure is taken in the little joys, Troy escapes the weekly grind and numbs his disappointments in a variety of ways, some harmless self-indulgences like reminiscing his glory days as a ball player (batting the tethered ball hanging from the backyard tree), or drinking on a Friday night as he does so - but others more selfish and wounding to those around him. Details, secrets and revelations are craftily paced, unpacked and exposed throughout the narrative (including Troy's reminiscent tales he retells over a drink). Many symbolic devices are also at play, but like the themes and analogies flowing throughout (including baseball home runs and trike outs, building real and figurative fences, keeping the Grim Reaper at arms length, and Gabriel blowing his horn for the rapture), it is not forceful or too much of a blatant flag being waved, its significance subtly and profoundly revealing itself. With Troy as the focal point, his family (together with his colleague and friend Bono) love, admire, tolerate and dislike him in equal parts, all acting as moral satellites reflecting back at him, but whether it penetrates his headstrong personality is a high hurdle to overcome, his intensity a fluctuating one. The strife and hardships of Troy's past (including a nasty father), which helped to shape him into the man he is (for better and worse), plays a significant role in his treatment of his family, his expectations of them to rise above, but at the same time stunting them from striving for their dreams (like Cory wanting to become a football player and Lyons wanting to be a musician). His failures, afflictions and disappointments has him inadvertently and contradictorily nullifying the aspirations of others, while professing wanting them to do better than him and the disadvantages he faced. The racial issues of the time is naturally a presence, with civil rights far from realized. But it is illustrated honestly and looks at how its residue has molded this family internally, very little of the outside world and its wider discrimination policies depicted. This is Washington's third feature film directorial effort (previously helming Antwone Fisher and The Great Debaters). As an award winning actor, he's highly adept at pulling the performances from the actors, making him the ideal man to realise this film. Clocking in at almost 140 minutes, it could be taxing on some (who prefer Batmobiles and Autobots), but even being a dialog-heavy film, it is engaging enough to keep you rapt throughout.